These ArcGIS shapefiles work with the free ArcExplorer GIS viewer, ArcView GIS, ArcGIS, Maptitude, Mapinfo, Manifold, TatukGIS and many other commercial GIS and mapping programs and many free GIS programs as well. Use our free Learn2Map GIS Tutorial and Atlas to add streets, highways, census information and much more to your maps for free. We have included free national level base maps with each map archive listed below. Also, check our free GIS software and free GIS ArcGIS shapefiles pages for more information and free ArcGIS shapefiles. If you are new to GIS, check out our free Learn2Map GIS Tutorial and Atlas. The U.S. nuclear energy facility GIS map layers is derived from the latest Nuclear Regulatory Commission data. 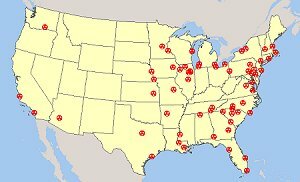 After examining lists in various reports and at government and NGO websites, I've determined that there are 65 operating nuclear power facilities in the U.S. Each facility has from 1 to 3 reactors for a total of 104. Data fields include: facility name, number of nuclear reactors, city, state, longitude and latitude. The shapefile includes access to free GIS base files. Click here for a description. The cost is $97 and you can download the shapefile immediately. The image(s) on this page are examples of how thi shapefile may look when loaded into a GIS program. Your GIS maps may not look exactly like this. Each GIS program is different. Shapefiles themselves are a collection of points, lines or polygons. They have no attributes. It is up to you, the user, to define colors, line width, symbols and other attributes within the limits and capabilities of the GIS programs you are using. The shapefiles on this page are copyrighted as follows. Copyright © 2012 Michael R. Meuser, All Rights Reserved. You may use these shapefiles in any GIS project or to make maps. You may not create copies of the shapefiles for the use of others whether for personal or commercial use. You may not resell the shapefiles. If you require multiple copies of the same shapefile, please contact Mike at [email protected]. Thank You. The geodata and shapefiles found at MapCruzin.com may come from a variety of government, non-governmental and self-reporting private sources. While we try to assure the accuracy of this material, we cannot promise that it is absolutely accurate. We do promise that using the map layer will be fun, entertaining or educational - possibly even frustrating. Beyond this, we make no guarantee as to its suitability for any purpose. We assume no liability or responsibility for errors or inaccuracies. Please understand that you download and use these map layers and data at your own risk.